Well, I told you Annihilation was nonfiction. Did you listen? No, of course not. No one listens to me. Even so, this insanely-rare albino lobster-- 1 in 100 million, allegedly --was caught off the "New England coast," which only narrows it down to several thousands of miles of actual coast when you factor in all the islands and such. 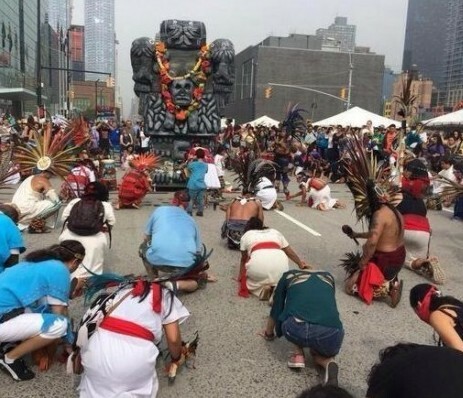 New Yorkers praying to Coatlicue. In New York. Today's the 101st anniversary of Jack Kirby's birth. Yes, yes; I realize I missed his centennial but there might have been a few other things going on at the time, no? And I'm not going to go into too much detail here anyway since it's the end of August and everyone's at the beach. Or the pool or at the grill. But it finally dawned on me that Kirby and fellow oracle Elizabeth Fraser's birthdays are back-to-back (I'm slow like that) and there's probably a deeper astrological meaning behind it. 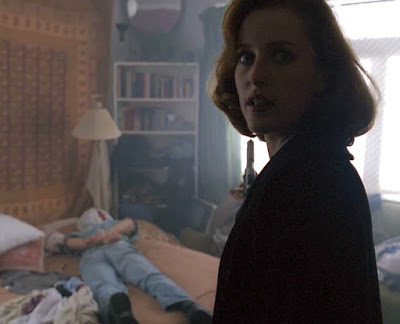 But since I can barely even remember the Zodiac, I'll leave that analysis to the experts. However, I'd be remiss if I didn't drop the whole Regulus in Virgo business here again, seeing as how Kirby's nickname was "King" and that Our Lady's namesake was known as "the Virgin Queen." I never got the whole Dario Argento thing. I mean, I get it; I realize why hipsters would be drawn to his work. 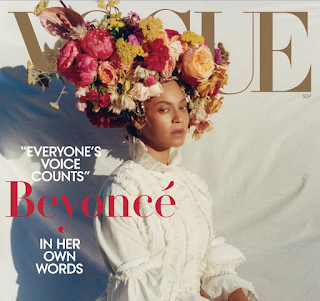 It's "stylish" and "surreal" and "transgressive." If you like that sort of thing. Me, I just find his film-making clunky and more than a bit mentally-sick. And not in a tormented visionary way, more in a Doc and Mharti or Boiled Angel kind of way. It's more like the aesthetic of John Wayne Gacy's clown paintings transliterated to film, for me at least. I guess that's the appeal, the "outsider" aura of it all. Whatever. Yawn. Even so, the timing couldn't possibly be worse for this slick remake of Argento's best-known film, Suspiria. 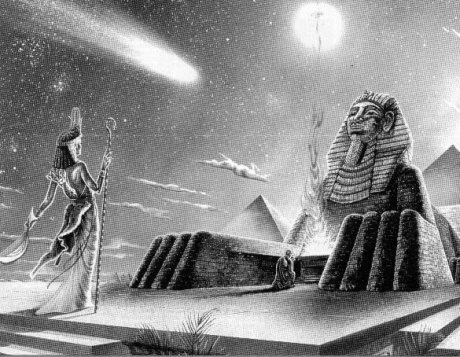 On Earth as it is in Heaven. Or Las Vegas. Man, here it is being World Regulus Day and none of you folks even sent me a card. That really hurts my feelings, y'know. I mean, not even an eCard? After all I do for you? Cold. It's especially wounding since some astrologers are saying this is the big kahuna of Regulus Days, the zero point, the nexus, the crucible. From now on everything changes. Why? The music-counterfeiting wing of the Entrainment Industry sent their finest lipsynchers to lower Manhattan's Nephilim Cathedral Oculus to attend the prestigious Golden Freemason Awards. Pop's biggest brainwashed mannequins names vied for Most Entraining Corporate Music-Adjacent Simulacrum in a diverse range of music-counterfeiting categories, ranging from fake Hip-Hop to fake R&B to fake Pop. 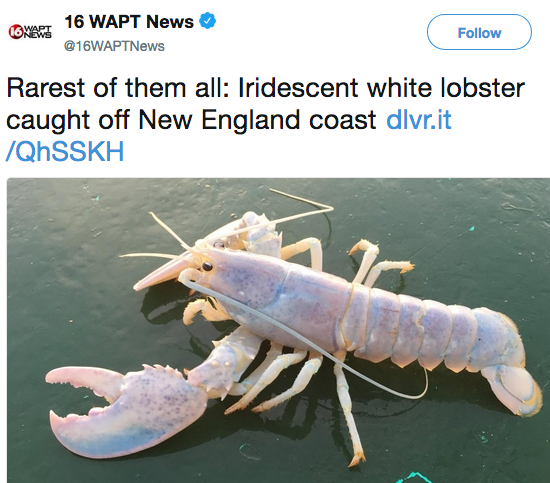 Cthulhu's Stepchildren: CRISPRs from the Black Lagoon? I saw a funny story the other day. Apparently a bunch of scientists at Oxford declared that not only is Earth life unique in the galaxy, it's unique in the universe. I'm guessing they know this because they've been there themselves. I got a chuckle out of this because not only do these types not know what's in our solar system (never mind the universe) they don't even know what's in our oceans. Or for that matter, our lakes. Kind of says it all, doesn't it? I'm sure a lot of you have seen this video already but to me it feels like more than just a viral news story, it feels more like a metaphor. Or at least I hope it is. I kinda hope that we're all like this surfer, negotiating all the massive disruptions all around us, geological and/or political and/or social. Just how weird are these times we are living in? Well, they're so weird that there's a new branch of the military in the works called the "Space Force." Now, I've talked quite a bit about "Starfleet Reality" and the Star Trek timeline but I never thought things would go this far this fast. And by that I mean I figured all the toys they've been working on out in the Nevada desert would stay in the black until conditions necessitated their unveiling. Goes to show what I know. Space Force. Nothing but Space Force. 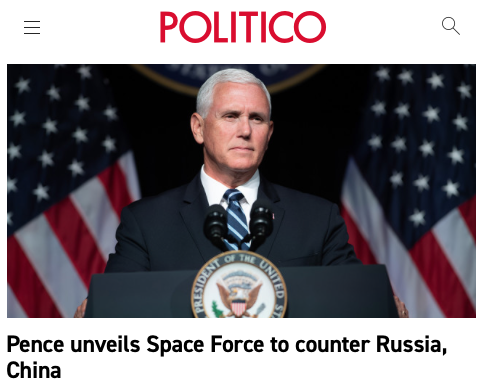 For reasons no one can seem to fathom, the Trump Administration launched the rumored Space Force branch of the military thereby officially kicking off the Age of Militarized Space, at least the overt phase in that program. VP Mike Pence was tapped to make the announcement, just in case anyone might mistake this all as just another skit in the ongoing Donald Trump Variety Hour. No, this is serious as a heart attack. And I can't help but wonder who the intended receiver for this unambiguously-bellicose transmission really is here. But not all that much. Vogue, who've been at the forefront in driving the Pearl meme this year, are featuring guest-editor Beyonce Knowles-Carter for their September cover. And lo and behold, Mystery BeyBalon took the opportunity to crown herself with Garlands. Secret Sun readers expect nothing less. 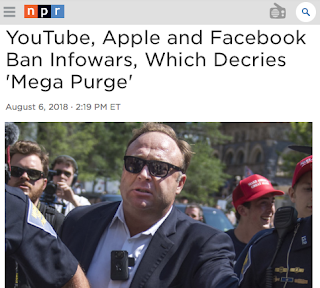 The big news today is that Big Tech purged Alex Jones from their platforms in what looks like a coordinated effort. Everyone's going to have their own opinions on this but mine is that this is the latest skirmish in the ongoing spywar raging beneath the placid summer surface in this great land of ours. I'm a big fan of the maxim "stay in your lane" when it comes to popular culture institutions. I don't mean "pound the same idea into the ground until the world screams for mercy," I mean, "figure out what made people pick your idea out of an endless ocean of competitors and clamp down on it like a snapping turtle." Doing so effectively calls for wisdom and for a deeper understanding of archetype and group psychology, something most creative types aren't exactly known for.